I didn’t intend on blogging anything tonight, but as I finished putting together my dinner in the kitchen and being joined by Drew in the kitchen, who having missed me took it upon himself to get off of the chair and walk to be with me, I have once again become inspired and amazed of how much our lives have changed over the course of the last two years. I just can’t put it into words how dramatically amazing I find Drew’s transition from 100% handicapped to the boy he is today. I’m afraid that no matter how I describe it or how many times I say it, no one will truly understand the impact of these previous surgeries. Since the surgeries and his therapies, I have experienced many exciting things with Drew that would normally not be so blog-worthy. Such as walking hand in hand. A couple of weeks ago, I had the rare opportunity to take Drew to therapy without Holden. 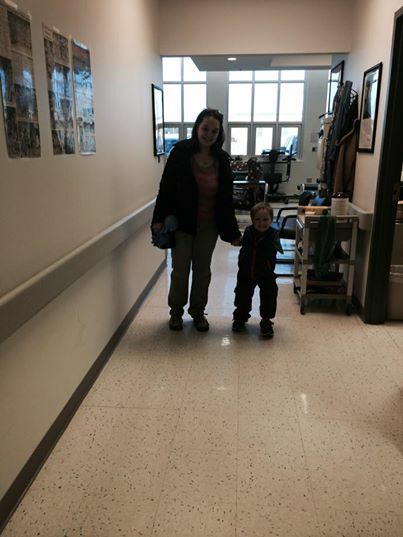 As Drew walked inside, Drew asked if we could hold hands and we walked hand-in-hand as mother and son. I looked down at Drew, who I was not holding up or supporting in any way – providing no source of assistance as I typically would have, and he was walking as if it weren’t special. He didn’t rely on me for the first time. There wasn’t any simulation of walking in order to hide the fact that he was incapable in a passive way to boost his confidence. He was genuinely walking – something that I was never sure would happen. I recall all of my previous posts outlining my stress, Drew’s pain, our misery through surgeries, adjustments, casts, therapy and more and it’s an amazing feeling to be sitting at this computer with a whole different tone and outlook. Up until recently, when I left the room Drew would yell for me, across three rooms, to bring him something to drink or that he had to go to the bathroom. I would have to yell back a response and we’d have this obnoxious conversation at the top of our lungs (I was usually putting dishes away or in the middle of cooking dinner.) I would be required to stop what I was doing and run across the house to retrieve a toy from a table four feet away or carry his 35 pound dead weight across the house for a bathroom break and back again and then return to my original task. Just a bit ago, I was in the kitchen making me a snack and what do I hear but footsteps, complete with the recognizable click-clack of his braces, walking into the kitchen to see what I was doing. He had simply hopped off of the couch and walked to me. I can’t fully express to you how amazing this is. He decided on his own that he wanted to see what I was doing. Did he yell at me to ask? Did he just wait until I came back into the living room? No. He got off of the couch and walked into the kitchen to talk to me. I’m just in awe. This is what any other child would do and now my child – DREW – just did that. Seeing as he is walking so well without any watchful eyes, it’s got me thinking of ideas about how to further enhance independence. Right now, he uses nearby furniture to lean on and push up from a sitting position to a standing position. So, if he’s not nearby something of the appropriate height, he as to do this fancy roll over to something to use as a “crutch.” I figure that I might be able to come up with some kind of portable device that he can use to help. Also, sometimes he needs help getting on to the couch, so maybe I can think of something to help him with that too. 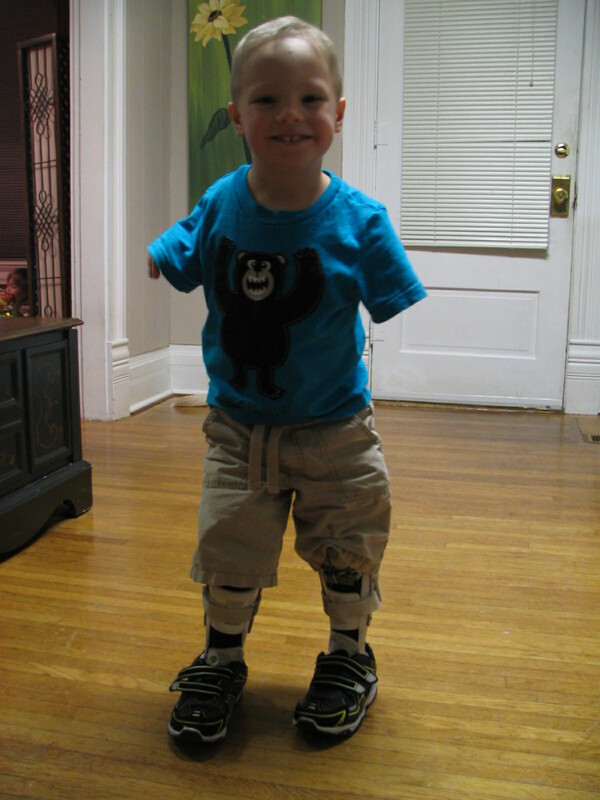 And, now that we’ve finally arrived at this point, we can start thinking of other ways to help him achieve more with his arms such as picking something up from the floor and maybe dressing himself although this one will require a lot of thought because with the amount of tugging and wiggling it takes for even us to get his pants over the parts of his braces that catch every little wrinkle in his pants, I’m not sure what can be done to adapt. Drew is truly a ‘walking’ miracle:) I’m so proud of him and happy for you – what awesome parents you are! Thank you very much 🙂 We are so lucky to have Drew! !